What a wonderful thing to step into a classroom and find this illustration on the blackboard. It’s the work of my student Hannah Isabel Gay. Major props, Hannah. The scene is from the final moments of Sophocles’s Philoctetes. The Greek warrior Philoctetes, son of Poeas, suffers from a foul-smelling, never-healing wound. His fellow Greeks abandoned him on the island of Lemnos as they sailed to Troy. But now, nine years later, the Greeks need Philoctetes and his magic bow (a gift from Heracles) if they are to take Troy. Odysseus and Neoptolemus (Achilles’s son) travel to Lemnos to bring Philoctetes back. But how? By force? persuasion? deceit? And will Neoptolemus go along with Odysseus’s plans? At the play’s end, as Neoptolemus prepares to take Philoctetes home, Heracles appears above the entrance to Philoctetes’s cave and declares that Philoctetes must go to Troy, where his wound will be healed and he will win great honor in battle. The classicist and director Peter Meineck offers an inspired suggestion: because the actor who played Odysseus would now be playing Heracles, perhaps “Heracles” is Odysseus in disguise, and the divine command just one more Odyssean deception. Treat? Or trick? 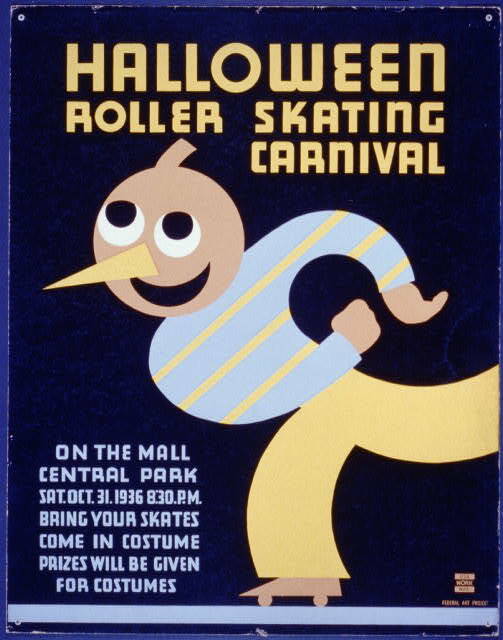 That’s the friendliest pumpkin-headed roller-skater I’ve ever seen. Happy Halloween. Poor flowers Allen Ginsberg, not stealing, not ripping off. 1. Go to the Library of Congress Classification Outline. 2. Find your first initial. Click. 3. 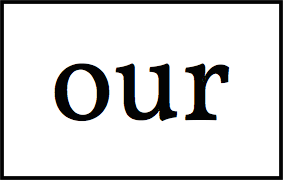 Look for your last initial to determine whether you have a one- or two- letter code. My wife Elaine has a one-letter code: E. There is no EF. Elaine’s LCC title is History of the Americas (America, United States). I have a two-letter code: ML, Literature on music. I remember noticing that code when I was an undergrad borrowing Bill Cole’s biography of Miles Davis from my college’s library. ML, huh. To wither in my brest, as in his blood. once powerful mad American locomotive? Difficult (at least for me) to think that the phrasing is just coincidence. Both poems may be found online. Things are back to normal on the Hi and Lois production line. 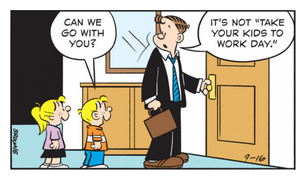 Follow that painting: if today’s strip is to be believed, the Flagstons’ facade includes a door to an interior room. Shades of the Overlook Hotel. “To prefer something that is better-looking, faster, more reliable, and which puts you firmly in control: where’s the shame in that?” Lucy Kellaway prefers paper calendars to digital ones. Her favorite: a Moleskine datebook. Her commentary begins at 13:13 (from the BBC broadcast Business Daily). “It is an asylum or — what do they call them now? — a rest home, for the infirm, the aged, the discontent, and the otherwise incompetent. Look at the three of us — we are the University. The stranger would not know that we have so much in common, but we know, don’t we? We know well. . . . I think that the sense of academic life as a refuge, a monastery of sorts, was once real, though it may not have been voiced with David Masters’s frankness. I can think of several professors from my undergraduate experience who would have been lost in the so-called real world. But the sense of refuge, if ever it was real, is long gone. Careerism rules. Stoner is available as a New York Review Books reprint (2003). It’s an extraordinary novel. Though still revered, The Elements of Style, to be honest, is a little dated now, and just plain wrong about some things. Strunk and White are famously clueless, for example, about what constitutes the passive voice. Dated? Yes. “Temporally incorrect” is how I like to put it. And some of Strunk and White’s cautions and preferred usages baffle. But this business about “famously clueless”: like Pinker, McGrath repeats Geoffrey Pullum’s claim that Strunk and White do not understand the passive voice. As I’ve argued in a response to Pullum’s take on The Elements of Style, that claim is a misreading of the plain sense of Strunk and White’s text. Follow the link and see if you agree. For a more thoughtful (and critical) appraisal of The Sense of Style, I’d recommend this review. Alex Sheremet patiently takes apart passages that Pinker presents as showpieces of good prose. In so doing, Sheremet makes me suspect that The Sense of Style ’s sense of style will make me slightly crazy. I am waiting for the library to make it happen. An interested reader can find my pre-Sense of Style take on Pinker and Strunk and White in a post about a 2012 Pinker lecture. That post has had a number of visits from Harvard and environs, and I’ve wondered, of course, if one (or more) of the visitors might have been Steven Pinker. But I doubt it. Like the 2012 lecture, The Sense of Style gets the story of The Elements wrong, stating that E. B. White turned William Strunk’s “course notes“ into a book. A good piece debunking the would-be debunkers of Strunk & White: http://t.co/cxvURa38kW How does @sapinker get away with this stuff? December 20, 2014: I’ve written a review of The Sense of Style. Did David Foster Wallace hit a backhand with one hand, or two? One. The Los Angeles Police Department notebook, as seen in the television series Dragnet, is a thing of beauty. Miranda rights are printed on the cover. I wish I could find a photograph online. 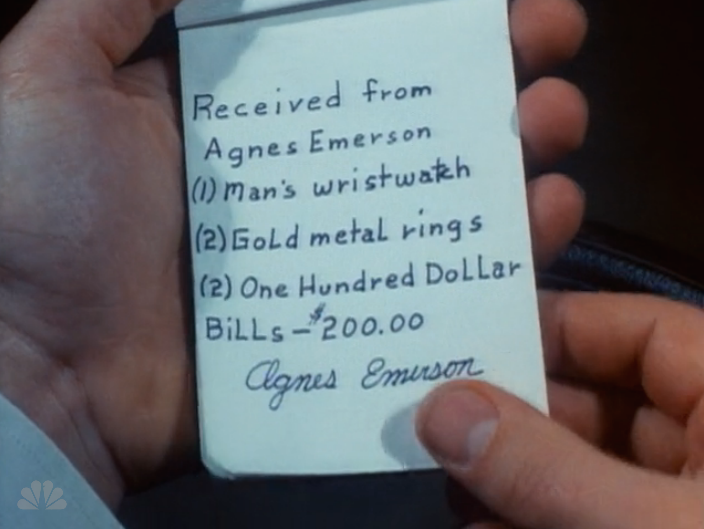 A missing notebook is the crucial element in a Dragnet episode devoted to an internal investigation. A dead man’s landlord claims to have turned over the man’s few valuables, including $1000. The cops, who wrote two receipts, say it was $200. The landlord says she threw her receipt away. The notebook with the cops’ copy is missing. 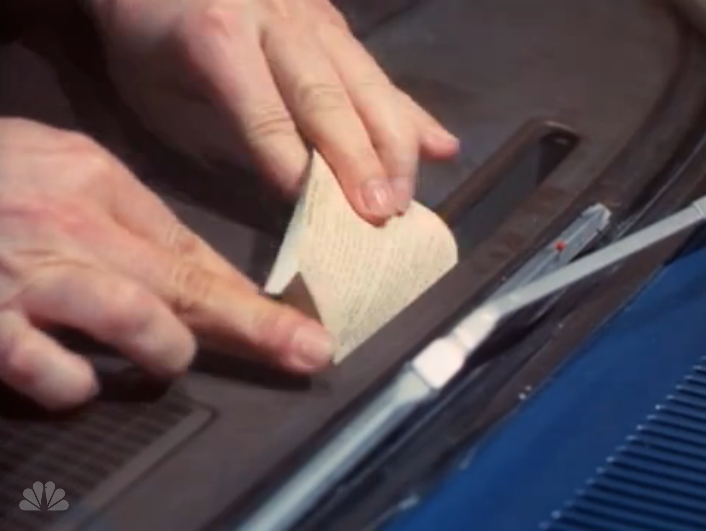 The notebook slid under a car dashboard, where Joe Friday finds it and saves the day. 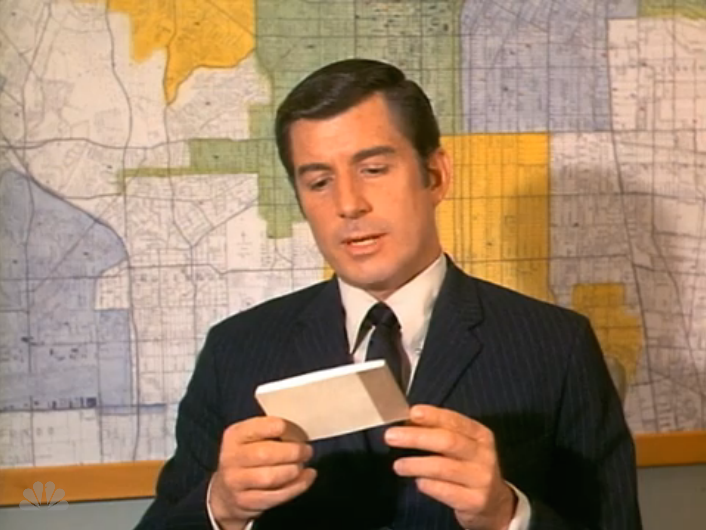 Given Jack Webb’s close connection to the LAPD, I wanted to assume that these notebooks are — or were — the real thing. The answer is were . I called the Los Angeles Police Revolver & Athletic Club’s store this morning. The two men I spoke with knew exactly what I was asking about and said that these notebooks are no longer used. You can find these notebooks and their episodes — one, then the other — at Hulu. The report in full is available as a PDF. The Chronicle of Higher Education has extensive coverage of the report’s findings: Key Players in Academic Fraud at UNC, Three Key Findings in Chapel Hill’s Academic-Fraud Investigation, Widespread Nature of Chapel Hill’s Academic Fraud Is Laid Bare. January 1, 2015: heads are rolling: Professor Among 4 Fired in UNC Academic Fraud (The New York Times). Jaimie Lee is among those gone. Life in North America feels more dangerous today. 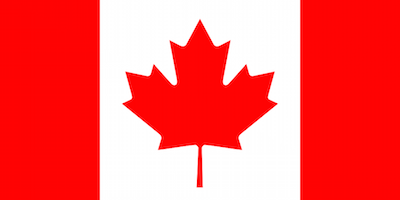 Stay safe, Canada. Something interesting on my front step this morning — a postcard from my future self. Thanks for putting in the time grading all those essays last Thursday and Friday. You could have spaced them out over many more days, but you didn’t. And thanks to you, the past six days have been grading-free. Way to go. Writing to one’s future self may seem to you (as it does to me) awfully corny. Getting a note from one’s future self is another story. I find that thinking about my future self can be helpful in getting work done, again and again. FS FTW. I updated my Mac to Yosemite today and found myself disappointed with its system font, Helvetica Neue. Eww. The font may look good with a Retina display — I wouldn’t know. On my MacBook Pro, it looks plug ugly. The smaller it is, the worse it looks. The good news is that it’s ridiculously easy to switch back to the familiar and highly readable Lucida Grande. GitHub has a page with the necessary download. Thank you, schreibenstein, whoever you are. Another GitHub page has files for Fira Sans. Thank you, Jens Kutilek. Yosemite’s new Finder icon makes the old one look downright dignified. Not an improvement. And the greyish menus make OS X 10.10 feel more like 10.4 (Tiger). Yosemite’s bright blue folder icons make me think of Breaking Bad, but these days everything makes me think of Breaking Bad. Elaine and I are blasting our way through its six seasons. What I like about Yosemite: things look (mostly) brighter, cleaner. Coming out of sleep, the computer seems to connect to wireless more quickly. And the redesigned Spotlight is very fast. Bravo for that. “Without walking and the contemplation of nature which is connected with it, without this equally delicious and instructive, equally refreshing and constantly admonishing search, I deem myself lost, and indeed am lost. With the utmost attention and love the man who walks must study and observe every smallest living thing, be it a child, a dog, a fly, a butterfly, a sparrow, a worm, a flower, a man, a house, a tree, a hedge, a snail, a mouse, a cloud, a hill, a leaf, or no more than a paltry discarded scrap of paper on which, perhaps, a dear good child at school has written his first clumsy letters. Robert Walser loved to walk. He died while walking on December 25, 1956. “I’m still here but yet I’m gone”: Glen Campbell’s “I’m Not Gonna Miss You” is a powerful song. To my mind it belongs in the company of the Beach Boys’ “’Til I Die” and Johnny Cash’s recording of Trent Reznor’s “Hurt”: existential statements, all. The photographer Ronnie Farley on New York water towers: “They’re the only natural looking thing in the skyline.” There’s a story at WNYC’s Studio 360. And here’s a portfolio of Farley‘s water-tower photographs. Of the two water-tank manufacturers mentioned in the WNYC story, one has a website (with vertigo-inducing photographs); the other has a website coming soon. A striking phrase from Rolfe Humphries’s 1955 translation of Ovid’s Metamorphoses: “the damned desire of having.” The phrase ends a catalogue of new arrivals from the Iron Age: “trickery and slyness, plotting, swindling, / Violence and the damned desire of having.” In Latin, book one, line 131, it goes like this: “amor sceleratus habendi ,” the polluted, profaned, defiled love of having. I love the Humphries translation of the poem. His Lucretius is somewhere on my (imaginary) to-read list. 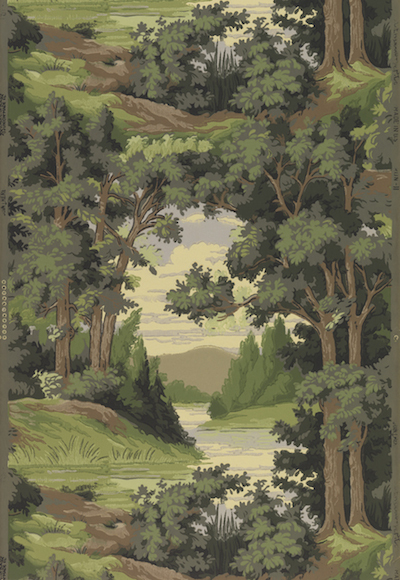 Cooper Hewitt’s Object of the Day, yesterday: mid-twentieth-century scenic wallpaper, manufactured by the J. C. Eisenhart Wall Paper Co., Hanover, Pennsylvania. Imagining a wall of this stuff makes me think of the problem of infinite regress. It’s rivers and trees, all the way down. And across. You can subscribe to Cooper Hewitt’s Object of the Day and get all kinds of interesting objects through the mail. Mark is back from Africa and just back from fishing with Rusty. He has asked neighbor Mitch Wilson to come over. Mark to Mitch: “I’m aware of your expertise with a longbow.” What are you trying to say, Mark? A weirdly sexualized archery contest follows: Mitch shoots (THIP), Cherry shoots (THUP), Mark shoots (THK), and Mitch splits Mark’s arrow. That's the sound of SHUK. Oh SHUK. 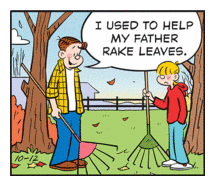 I like this panel from the October 15 strip. Cherry’s is-it-a-smile-or-is-it-a-grimace suggests that her real calling was a career in Grade-B noir. Careful, Mitch. And Mark. He led me along an upper cloister to see an Irish monk of immense age and great charm. His words are all lost, but I can still hear his soft West of Ireland voice. Except for his long Edgar Wallace cigarette holder, our host could have sat for a picture of St. Jerome. Edgar Wallace (1875–1932) was a writer of immense output. Today he may be best known as the writer of the first draft of the screenplay for King Kong (1933). 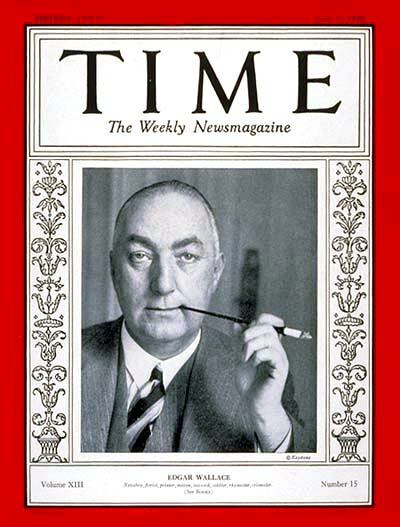 Wallace appeared on the cover of the April 15, 1929 issue of Time, cigarette holder in hand and mouth. The image of St. Jerome with a cigarette holder is best left to the individual imagination. In one of its aspects, art is a technique for focusing attention, for teaching skills of attention. (While the whole of the human environment might be so described — as a pedagogic instrument — this description particularly applies to works of art.) The history of the arts is tantamount to the discovery and the formulation of a repertory of objects on which to lavish attention. Back in grad school, I put these sentences on the syllabus for my freshman lit and comp class. Some nerve. I was an optimistic kid. Still am. “I love the idea that somehow this is the universal question, the thing that unites us”: Where do birds go when it rains? (xkcd). In complaints filed with the International Trade Commission and in federal court, Converse claims that 31 retailers and manufacturers have infringed on one or more of its shoe’s trademark designs, including one or two black stripes, and the so-called cap above the toe. The Converse star is not in question. Read it all: Converse Sues to Protect Its Chuck Taylor All Stars (The New York Times). Converse All Stars puzzle me. At one time I lived in them. I still have a pair that I wear once a year, when I dress up as a younger me on Halloween. How I — or anyone — ever played basketball in Chucks is beyond me: they offer no support. Checking on the fortunes of university hashtags always fills me with dismay. Yesterday, for instance, a tweeting undergrad advised prospective students to prepare for liver damage. His tweet coincided with a day-long open house for high-schoolers. Brilliant. This undergrad has company everywhere — tweeters who proclaim that they get weird, that they go hard, that their schools outdo all others in getting and staying drunk, hashtag, hashtag, hashtag. Granted, such tweeters are a fraction of a fraction of any student body (or as William Strunk Jr. would have preferred, the studentry). Yet such tweeters contribute mightily to shaping — or disfiguring — a school’s public face. They give that face a bulbous rosy nose. O digital naïfs, when you take to the airwaves in these ways, you’re cheapening the value of your fellow students’ degrees, along with the value of your own degrees, should you attain them. That’s #stupid. Human relations in cartoon form: “Sexism goes both ways. Feminism helps both,” art by Rasenth, aka Razzy. At Oscar’s Day, “some rocks,” in conversation. Those walls! Or is it wall? This panel has the general strangeness that has prompted me to speculate that the Flagstons live in a German Expressionist suburb. See also this 2011 interior. The rooms of the Flagston house are often rendered, at least in the daily strip, in the most minimal way: white space and dripping black lines. The panel above is representative. Again with the dripping lines. But the background is, well, backier. Things are getting better. Here too, a better background. I especially like the care the artist has taken with the clapboards. Consider this 2008 panel as a contrast. The only real background: Lois. Lois, you’re a fine woman. You deserve better. 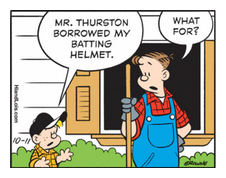 The amount of background detail in this panel from today’s strip is especially noteworthy. Depth! 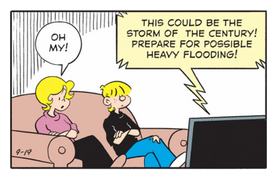 I look forward to the week of Hi and Lois anniversary strips that starts tomorrow. It will be interesting to see what happens to the strip’s art after that. A translation of a poem as vast as the Odyssey rises or falls not in its treatment of great, memorable lines — such as those that describe Argos, lying neglected and bug-ridden on a pile of dung — but in its treatment of what might be called ordinary lines, those that go by in a way that invites no special attention from a reader. Someone walks into town; someone offers a greeting; someone serves a meal: the translator must attend to it all. But not Dido, unhappy heart. Men’s bodies took the boon of peaceful sleep. All were asleep under the silent night. Not, though, the agonized Phoenician queen. all lie quiet now, under the silent night, asleep. But not the tragic queen . . . In FItzgerald’s translation, the clause beginning “cattle and birds” seems weighted down with prepositional phrases: “with vivid wings,” “in thickets,” “in the country places,” “under the silent night.” Fagles’s translation is marred by clichés (“dead of night,” “savage seas”), redundancy (“living creatures,” “calm, at rest”), and strangely extravagant phrasing (“gay and gorgeous birds”). Here as elsewhere in his translations, he . . . trails off. For my money, it’s Lombardo first, Fitzgerald second, and Fagles a distant third. A beautiful detail of OS X’s Text to Speech: “Alex,” by far the most natural sounding of the six Text to Speech voice choices, begins sentences of eight or more words with a slight inhalation. Seven words, no inhaling. Eight or more, he inhales. If you listen to radio or television commercials closely, it’s easy to notice missing inhalations. Omit needless breaths: that’s the logic, to cram in as many words as possible. The result of course sounds highly unnatural. That someone or ones at Apple took the time to work out a logic of breathing for Text to Speech is deeply impressive. Hey, Apple: I noticed. The meaning of a story should go on expanding for the reader the more he thinks about it, but meaning cannot be captured in an interpretation. If teachers are in the habit of approaching a story as if it were a research problem for which any answer is believable so long as it is not obvious, then I think students will never learn to enjoy fiction. O’Connor’s letter is available at Letters of Note. Just last week, after a wonderful lunch with Elaine, I was sipping coffee, and I felt a pang. If someone had offered me a cigarette at that moment, I wouldn’t have wanted to resist. But you can’t smoke in restaurants anymore, and besides, it was almost twenty-five years since I’d stopped. I am, like they say, so over cigarettes. Never even think of them even. Elaine and I wrote a song several years ago in response to an unusually specific Google search: “Please Don’t Smoke.” It’s addressed to seven-year-olds (really), but it’s good advice for all. 1. Literature exceeds criticism. There are no complete interpretations; there are only complete poems, novels, plays. 2. Criticism is about literature. It makes a gesture toward identifying or illuminating some aspect(s) of a work or works. 3. Criticism is not a negation of pleasure. Knowing more about what it is you’re reading can only inform and deepen pleasure, if there’s genuine pleasure to be had. Knowledge (not ignorance) is bliss. 4. One interprets, but one interprets what’s there. In other words, criticism involves a reader and a text. 5. We can value works that concern our own particular preoccupations. But we can’t merely hunt for — or worse, create — our own preoccupations within texts. We can also read for something other than our own preoccupations. Or we might find in a work of literature a new preoccupation. Thomas Merton, a Trappist monk, was a serious student of Buddhism. 6. It’s a truism to say that a work of literature means something different to each reader. But the meanings of a work of literature are contained in language, and words cannot mean anything. 7. What a text can be said to mean and what its author can be said to have meant: these are two ways of talking about the same thing. 8. The meaning of the text isn’t in an author’s mind but in all the relevant intricacies of her or his words. 9. How do you know what an author meant? By reading and reading and reading what she or he wrote and constructing a sense of what the text means. And, perhaps, after doing that for a long time, by reading what other (good) readers have written too. 10. A text’s significance is not of its author’s making. For instance, the ways in which the Iliad has a particular significance to the philosopher Simone Weil thinking about Nazi Germany, or to the poet Alice Notley thinking about the war in Vietnam. For instance, the ways in which William Wordsworth’s “I wandered lonely as a cloud” can serve as a paradigm for thinking about Romantic poetry and nature. 12. Good readers notice details, and they know what details have pointed them toward particular understandings of what they’ve read. 13. Many student-readers don’t realize that interpretation is typically a matter of adjusting and refining and revising — noticing one detail, noticing another, noticing something else that requires rethinking what you were thinking. The hermeneutic circle — from a sense of the parts we construct a sense of the whole; from a sense of the whole, we construct a sense of the parts — suggests that interpretation is continually under revision. All of which might mean that really reading works of literature often demands more time than is available in a survey course. 14. Many student-readers profess disdain for “the critics” while simultaneously seeing in critical work an enormous interpretive authority. 16. To say that an interpretation is plausible need not mean that you agree with it. To say that an interpretation is plausible is to say that it deserves consideration. Allowing for points of view other than your own is typically called critical pluralism. 17. What makes an interpretation plausible? The ways in which it accounts or doesn’t account for a text. What makes an interpretation implausible? The ways in which it accounts or doesn’t account for a text. The link between journeys and painting, especially this sort of journey, is very close. There was plenty to think about as I made my way through the snow-bound monastic orchards; and it occurred to me, in the silent fields that followed, and for the hundredth time since my landing in Holland, that so far one painter had presided over every stage of this Winterreise. When no buildings were in sight, I was back in the Dark Ages. But the moment a farmhouse or a village impinged, I was in the world of Peter Brueghel. 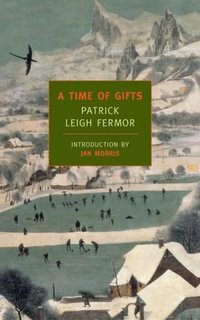 The white flakes falling beside the Waal — or the Rhine or the Neckar or the Danube — and the zigzag gables and the muffled roofs, were all his. The icicles, too, and the trampled snow, the logs piled on the sledges and the peasants stooped double under loads of faggots. When children with woollen hoods and satchels burst out of a village school with a sudden scamper of miniature clogs, I knew in advance that in a moment they would be flapping their arms and blowing on mittened fingers and clearing a space to beat a top in, or galloping down a lane to slide on the nearest brook, with everyone—children, grown-ups, cattle and dogs — moving about in the wake of their own cloudy breath. When the wintry light crept dimly from slits close to the horizon or an orange sun was setting through the branches of a frozen osier-bed, the identity was complete. The cover of the New York Review Books reprint shows a detail of Hunters in the Snow. Muffled roofs: exactly. Katy Homans is the book’s designer. Here is an article about her NYRB covers. Naut. Things which form a necessary part of the equipment of a vessel, but are in the way at certain times. a. Naut. Weight or encumbrance aloft: orig. said of the upper masts, sails, and rigging of a ship; later, also, weight or encumbrance on the deck, as in a steamer, ironclad, etc. Though the top-hamper of houses had long been removed, and the piers patched and strengthened at various times, the [London] bridge was becoming every year less and less adapted for accommodating the increasing traffic to and from the City. The everyday equivalent of the bell-hamper might be the walls that enclose rooftop water towers. Do you see how much work went into figuring out hamper? That’s why it is the word of the day. At least Bourdain — or his native informant — had the good sense to include a visit to City Island. But to pass up Arthur Avenue? Where Marty Piletti butchered? Not exotic enough, I guess. Marone. Grammar brawl There’s a plea. Tomorrow night on CNN: Anthony Bourdain: Parts Unknown visits the Bronx. I picked up a head of red leaf lettuce at the supermarket the other day. “Locally Grown,” said the wrapper. The grower is in Michigan, 268 miles away. (iii) about which the distributor has conveyed to the end-use consumers information regarding the origin of the product or production practices, or other valuable information. The first two conditions seem nearly contradictory: few if any shoppers at a farmers market would think of “locally grown” produce as having originated 400 miles away. The joining of locally and regionally here engenders confusion. “Locally grown” begins to look meaningless: all produce, wherever it’s grown, is grown locally. The real question is where it’s sold. Grammar Revolution is a film from David and Elizabeth O’Brien. Any film with Bryan Garner and John McWhorter and Steven Pinker is a film I want to see, though I suspect that they and all other interviewees appear separately. It’s safer that way: no fireworks, or fisticuffs. In The New York Times, the story of Keep On Keepin’ On (dir. Alan Hicks, 2014), a documentary about the friendship of the trumpeter and flugelhornist Clark Terry and the pianist Justin Kauflin: “A Rare Musical Mentorship, Captured With Heart and Soul.” Here’s the film’s website. Many years ago I had the good fortune to interview Clark Terry for an hour on my university’s FM station. A Basie-ite. An Ellingtonian. A great musician, and a great man. 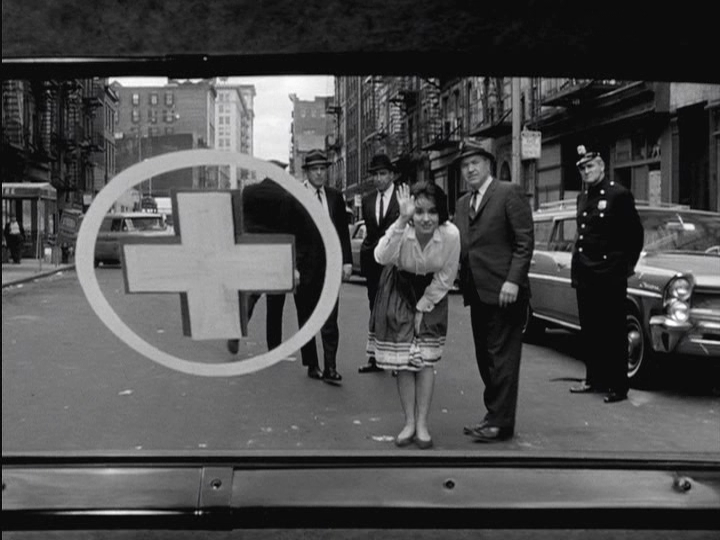 It would be nice to know whether the makers of Naked City knew that this episode was to be the show’s last. 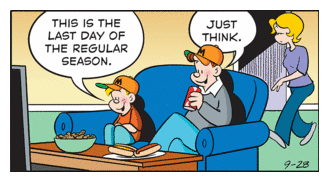 End of the season or end of the series — either way, the long goodbye is fitting. “Barefoot on a Bed of Coals” is a strange episode with a baffling start. 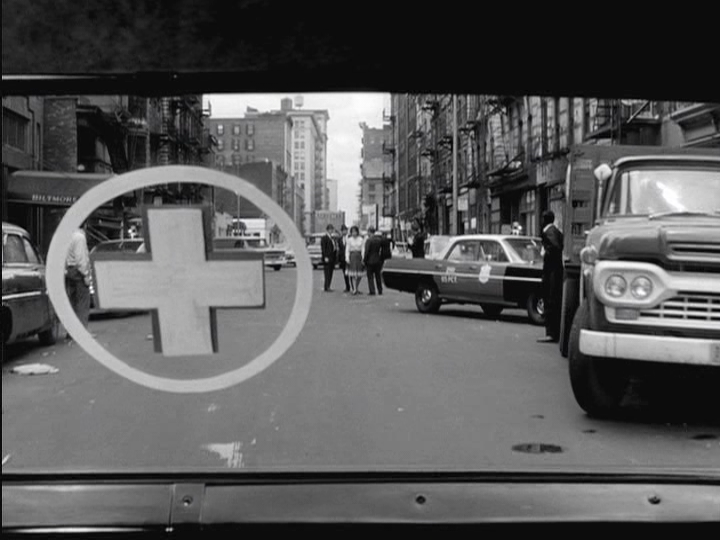 The episode looks at the life of Stanley Walenty (Steven Hill), a police wannabe who patrols his pretend beat wearing a real uniform and carrying a real gun. His downstairs neighbor Clara Espuella (Zohra Lampert) knows none of that. All she knows is that she’s smitten with Stanley. In the episode’s long final shot, Clara says goodbye to him as he’s taken to the hospital with a wound from a real criminal’s gun. 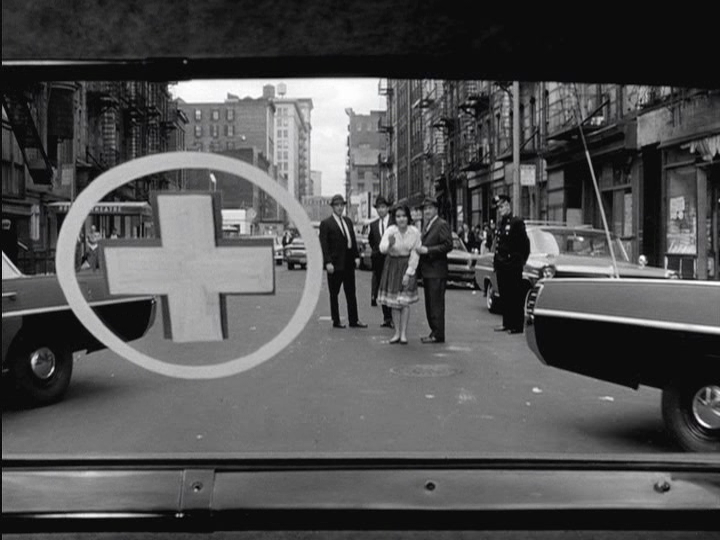 The final scene plays out on East Fourth Street, between the Bowery and Second Avenue. It’s an appropriate location for an episode focused on make-believe: this block of East Fourth was and is a world of theater. Notice the Writers’ Stage and East End Theatre on the right. 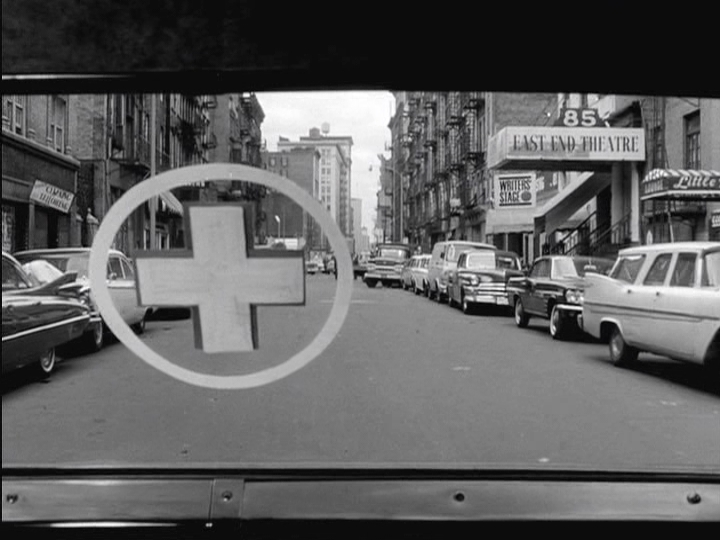 Today, the block is home to La MaMa (nos. 66 and 74A), Duo Multicultural Arts Center (no. 62), and the New York Theatre Workshop (no. 79). 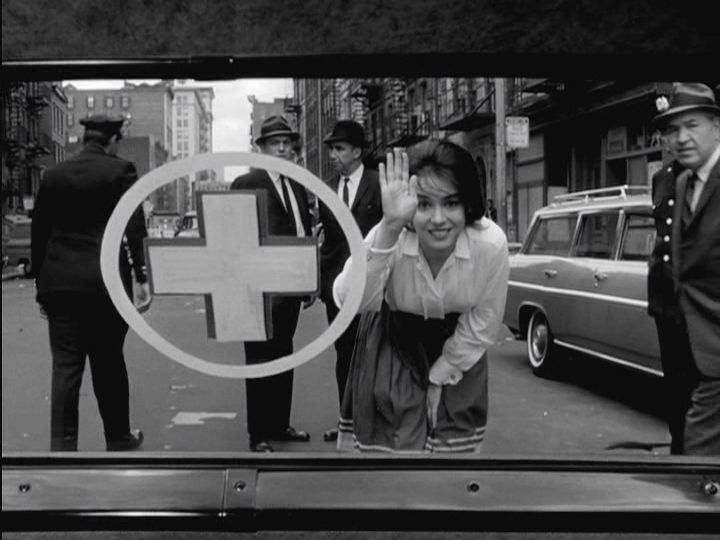 There are now fifty-three Naked City posts in the Orange Crate Art archives. Naked City is one the great television series, and it’s all on DVD. 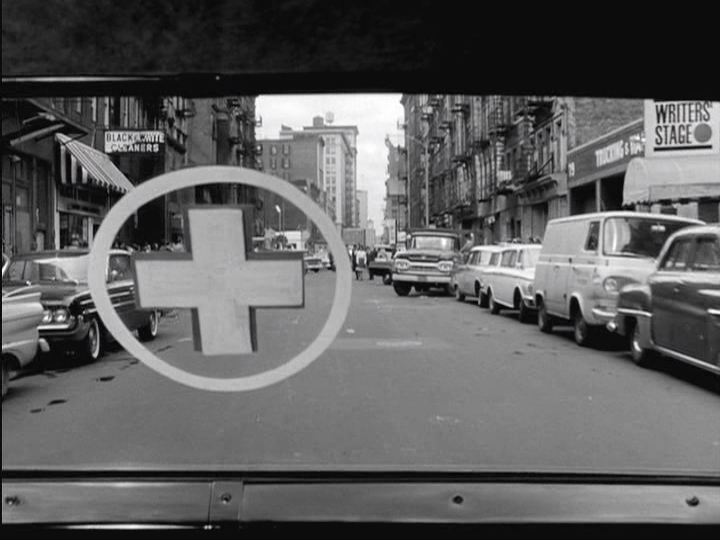 June 3, 2015: The closing shot of the film Side Street (dir. Anthony Mann, 1949) might have inspired this episode’s ending. See what you think. 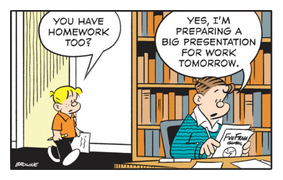 Wheeldex This dowdy-world object has turned up in a comic strip. 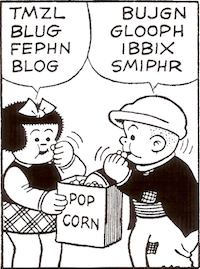 In a 2009 post about “the new literacy,” I wrote that I was beginning to see misspellings that I could never have imagined: and for an, pros for prose. As I later figured out, such misspellings are/our in fact spellings of the future, traveling backward in time to give us a foretaste of our — or are ? — language’s evolution. Our for are is one I’ve seen twice recently.